Safety First: YKK AP Baltimore Celebrates 800 Days Accident-free! As one of YKK AP’s 25 Fundamental Behaviors, the principles that guide and bring YKK AP America’s culture to life, we emphasize the importance of being vigilant about safety—Safety First. The ability to create a safe workplace is only proven successful through clear communication between managers and workers alike and through adherence to mutually agreed upon safety standards. The true definition of teamwork. Each YKK AP employee has inherent dangers they face throughout the day, but some employees are exposed to greater risks through their direct handling of metal. 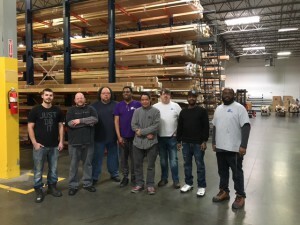 Our hardworking team of eight employees in our Baltimore branch are a part of this high risk group. Each day, they bring tons of metal in and out of the building, which they then cut, drill and shape into thousands of doors and frames. In accordance with the Fundamental Behavior, “Be Vigilant About Safety,” the team recently celebrated 800 days (over two years) of being accident-free! We are so proud of our hardworking Baltimore team for exercising safety first to protect both themselves and their teammates. Congratulations Team YKK AP Baltimore!